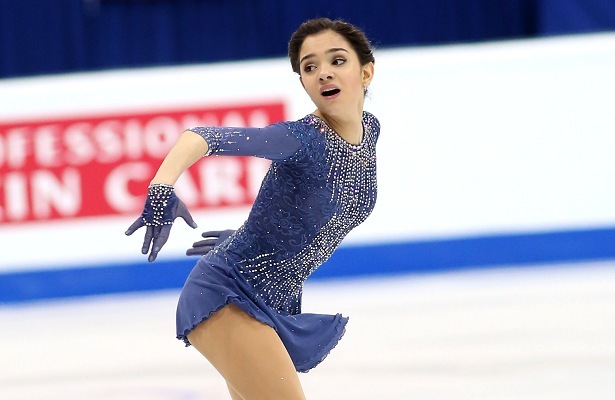 Russia’s Evgenia Medvedeva won the title in her debut at the 2016 European Figure Skating Championships. Evgenia Medvedeva of Russia led the sixth Russian sweep of the European Ladies’ podium at the 2016 European Figure Skating Championships on Friday. Elena Radionova picked up the silver medal like last year, while Anna Pogorilaya repeated as bronze medalist. Fifteen years ago at the 2001 ISU European Championships in Bratislava, the Russian Ladies had swept the podium as well with Irina Slutskaya, Maria Butyrskaya and Viktoria Volchkova. At this time, the current generation of athletes hadn’t even begun skating yet. The Grand Prix Final champion also earned level fours on her excellent spins and footwork, however, she crashed on a double Axel.Medvedeva led following the short program and was the favorite in her very first European championships. Her performance to “W.E.” by Abel Korzeniowski and “Allegro” by Rene Aubry was highlighted by a triple flip-triple toe, triple Lutz, triple Salchow-triple toeloop, as well as two more triples and a double Axel-double toe-double toe combination. “When I went into the Axel I thought ‘do it, do it’ and when I fell, I was like ‘oh no,'” she recalled. Still, Medvedeva won the free skate with 142.90 points as she picked up lots of positive grades of execution (GOE) as well as high component scores, including one perfect 10.00 for interpretation. The reigning World Junior Champion racked up 215.45 points to win the title, and the skater who is usually very composed, cried when her scores came up. Radionova, who was second after a good short, had skated first in the warm up group and threw down the gauntlet with a powerful performance to “Titanic”. The World bronze medalist hit a triple Lutz-triple toe, triple loop-single loop-triple Salchow combination, as well as three other triple jumps and two double Axels. Only her first Axel was wobbly. The 17-year-old scored 139.03 points and had 209.99 overall. Radionova revealed a new, elegant black and white costume. Pogorilaya started strongly with a triple Lutz-triple toe and triple loop-single loop-triple Salchow combination into her routine to “Scheherazade,” but crashed badly on a triple Lutz and triple loop. The 17-year-old picked up level fours for her spin and footwork, ranking third in the free skate (123.24) and overall (187.05). The skater had mixed emotions as she admitted it wasn’t a very good skate, but that it was good experience for her. Latvia’s Angelina Kuchvalska finished fourth, which is the best result for a Latvian figure skater since Konstantin Kostin placed fourth at the European Championships in the men’s discipline in 1993. She landed five clean triples and earned 176.99 points. Roberta Rodeghiero of Italy came fifth with a solid performance and 170.76 points, while France’s Maé-Bérénice Méité pulled up two spots after the short to finish sixth with 161.23 points.